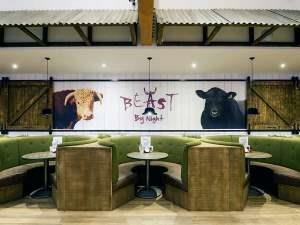 Beast by Night at Farmer Copleys Farm Shop01977 600200work RestaurantBeast by night! The café transforms 4 nights a week into Beast Restaurant. The Chefs team changes and is led by Head Chef Carl Frost, the front of house team changes, the uniforms change, the cutlery changes, the crockery changes, the lighting and even the wall changes and Beast awakens. Specialising in Steaks prepared by the butchery team and then cooked to perfection on the Charcoal Robata Grill by Carl and his team. The food is seasonal, home and locally produced celebrating the best foods available at that time of year. Beast by night! The café transforms 4 nights a week into Beast Restaurant. Claudio the sommelier is excellent at paring your choice of dishes with wines and the feedback to date has been that this is a great addition to the local area, so come a judge for yourself. Located on the main Wakefield to Pontefract Road. Opposite Pontefract Crematorium. From Wakefield follow signs to Featherstone and continue towards Pontefract.